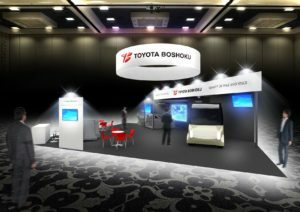 Kariya(JAPAN)–December 6, 2018– For the first time, Toyota Boshoku Corporation (TOKYO:3116) will exhibit at CES 2019, which runs from January 8th to January 11th, 2019, in Las Vegas, Nevada, USA. An interior space model that supports level-four autonomous driving. The space offers comfort to each individual occupant and introduces seat and interior parts technologies that detect the changes in occupant’s physical status and assess sleepiness and emotional state. In response, the technology stimulates the five senses with music, light and other devices to create feelings of safety and comfort. 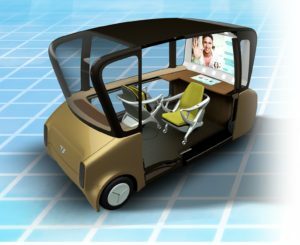 An interior space model that supports level-five autonomous driving. A space conceived for the provision of various services, from business to entertainment, with fully flexible seat arrangements and an array of necessary functions. Service value is increased through the stimulation of five senses in response to occupant behavior and circumstances. *2: Portmanteau coined from MOBILE and BOX, denoting a private space that can be utilized freely while in motion.